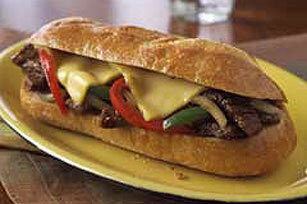 Peppers, onions and thinly sliced beef steak are flavored with steak sauce and served on crusty rolls with American cheese for a sandwich classic. Heat oil in large skillet on medium-high heat. Add vegetables; cook and stir 5 to 6 min. or until crisp-tender. Remove from skillet; cover to keep warm. Add meat; cook 1 to 2 min. or until browned, stirring occasionally. Add pepper mixture and steak sauce; mix lightly. Cook 3 to 4 min. or until meat is done, stirring occasionally. Fill rolls with meat mixture and cheese. Serve with assorted cut-up fresh vegetables and a small fruit salad.